Words I didn’t expect to type in 2017: I really like the new Knack. So much for the running joke that this PlayStation 4 exclusive is a sequel that no one wanted. Good thing we got it. Knack II is the follow-up to a mediocre PS4 launch game and is testament to the value of iteration. The new game, which is out this week, scrubs away most of its predecessor’s faults. The first game, which was released in late 2013, was pretty but tedious. It was one basic brawl after the next, stretched across a dozen worlds. 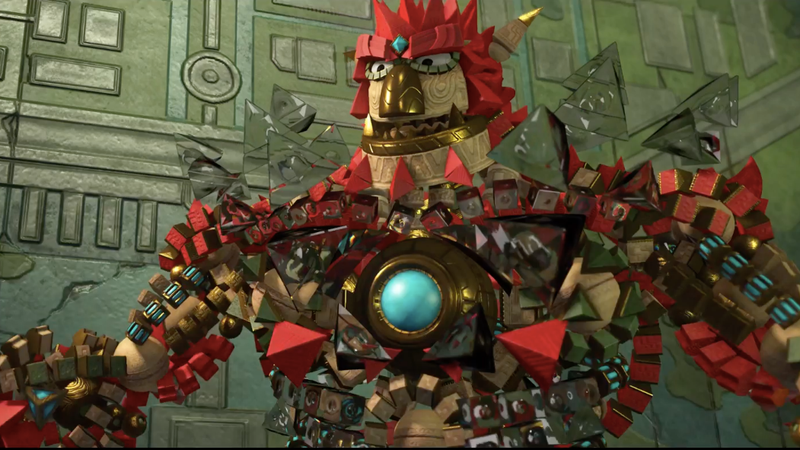 The first Knack was infrequently clever, making little gameplay use of the titular character’s core concept of being comprised of a bunch of swirling stone artifacts. Occasionally we could make Knack shrink to sneak through small passages. As we ran through levels collecting more artifacts, we could gradually make him grow. Once in a rare while we could assemble Knack’s outer shell out of a special element like wood. Mostly, though, we just punched and kicked a monotonous flow of enemies and tried not to die between checkpoints, which were rare. Four years later, what a transformation this new game is. It’s full of combat, but Knack’s arsenal of moves is greatly expanded with a punch flurry move, an extendable-arm power shot and more. This time there’s a 34-node upgrade tree that weaponizes Knack’s dodge, speeds up most of his moves and adds some new ones. Knack II is also full of platforming, but now levels are built around the new ability to shrink Knack down to child size at any time and then grow him back to whatever his large size is at the moment with the tap of a button. Levels are filled with reasons to swap sizes, be it to travel through the pipework between walls, amble across skinny ledges, or avoid traps. Every level contains sections where you’ll hit R1 to size down in order to move ahead. 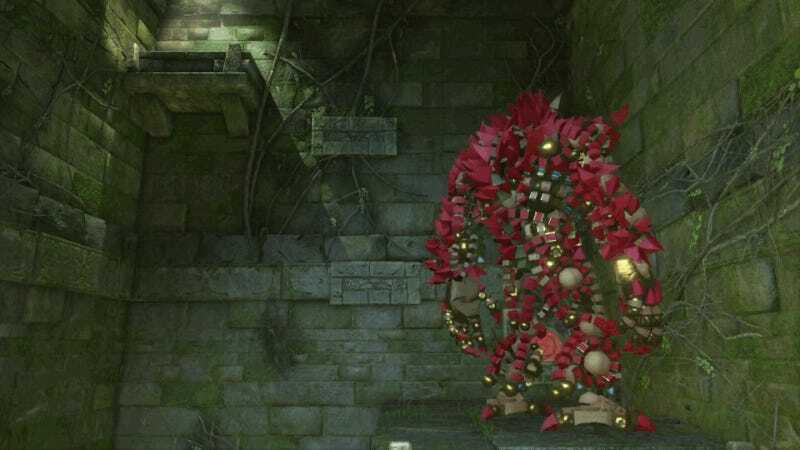 There are many optional, hidden passages for mini-Knack to go through, too. The old-school hostility of the first game is replaced with the modern gaming comforts of regenerating health and frequent checkpoints, which feel appropriate to the cheerful scene the game is often trying to set. The original Knack was a handful of basic design ideas barely expanded on. Knack II offers new, multi-layered concepts every level or two. 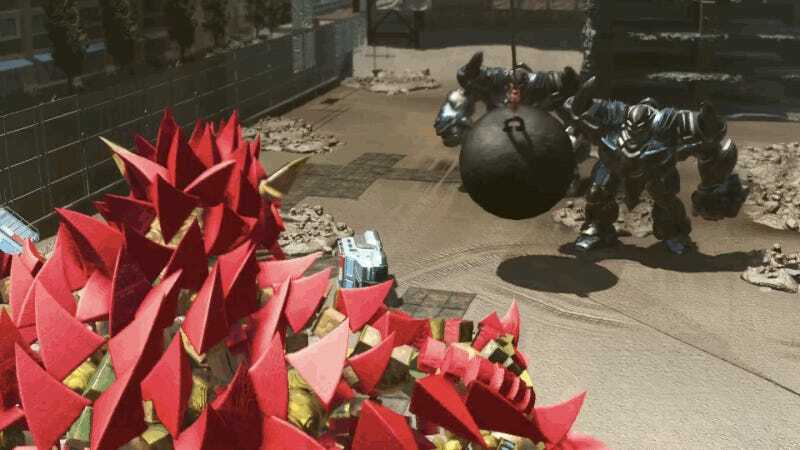 For example, first we learn that Knack can pull iron ore onto his body and that it empowers him to do special attacks that bash through tougher enemies. Soon after, we need to make Knack shrink and learn that, when he drops the rest of his body’s artifacts behind, the discarded iron chips form an unmovable statue. And just a little later, the player will notice that Knack needs something to hold a pressure plate down in order to move ahead. Hmm. I didn’t love Knack a year later after it was released, and I’ve mostly forgotten the game. For me, the PS4 has long since been the console of Knack. It’s the console of Horizon Zero Dawn and Nioh and The Witness, to name a few favorites I expect to love for years. Developed at Sony’s Japan Studio, Knack was the brainchild of Mark Cerny, the technology architect of the PS4 and an accomplished game designer himself. That game was better for its tech than its gameplay. A sequel smacked of a thank you to Cerny for designing a system that had performed so well. Let him have another baby whether anyone else is asking for it or not, I figured that Sony figured. I started playing Knack II a few days ago in the stolen hours of a busy weekend that I spent mostly away from my PS4. I thought I’d play a little just to size it up, just to ensure I could tell Kotaku readers what it was. I wasn’t expecting it to be bad enough to be interesting, and I didn’t anticipate that it might be really good. The first level didn’t do much to change my mind. Sure, it shows off Knack’s new size-changing system, but it is mostly a punch-kick affair. Then I played another level set in a forest and was introduced to a clever warping move. Then I played another few levels and I got to the iron statue thing. Later, there was a visually spectacular sequence with a catwalk. There was a clever bit with invisible blocks and exploding crystals. I was enjoying the combat, basic as it was (this ain’t my beloved Nioh), and then that got better when I was taught a neat hookshot move. I was slowly unlocking new moves in the skill tree, and I was enjoying the game’s very vivid, varied scenery. The camera zooms out during one of the game’s desert levels. I reached out to a colleague who also had a copy: was this for real? They hadn’t started it yet. I reached out to another peer who had the game. This thing is actually good, right? Yeah, they replied. They seemed shocked, too. The first Knack felt like a mediocre licensed game that was recommendable only because it was one of three launch PS4 games and a good showpiece for the graphical fidelity possible on the new system. You could get a better, if less visually striking experience, from playing any Lego action game out at the time. In some levels, you acquire enough artifacts to become a giant that can throw one hell of a punch. The new Knack makes a more exciting echo. It reminds me of the notes last struck on PlayStation by the platform’s enjoyable, attractive mascot games. It feels like a successor to the best action-adventures of Ratchet & Clank, Jak & Daxter and Sly Cooper, a robust lineage of games that has narrowed since their heyday on the PS2 and PS3. Those series were reliably entertaining. Their creators focused on the core abilities of the game’s colorful protagonists and built enjoyable levels around them. The games were never quite as ingenious in level design or character moveset as Nintendo’s finest, but they got close. Knack II, unlike its predecessor, fits right in. I’m only halfway into the game. Little time to play it and whatnot. Maybe it all falls apart. I doubt it, though. Knack II entertains with confidence. It doesn’t just dole out fun new combat moves and pleasant new gameplay mechanics. It exhibits an awareness this time around that even some of the old-fashioned gameplay its creators like is best presented with some modern flash. There are block-pushing puzzles, for example, but Knack is empowered to push those blocks quickly so that the block-pushing literally and figuratively never badly drags. There are quick-time events, but their button prompts map closely to the game’s regular combat controls and smartly emphasize the winning size-changing system that drives the design of the whole game. Even in this interactive cinematic, you hit R1 to change size. Even the basic platforming in Knack II is a pleasure—cliched as all of its jumping across collapsing platforms is—because it is rendered with charming clockwork complexity. We’ve done this kind of thing before, but it’s seldom looked this good. The platforming is basic, but the platforms themselves are meticulously detailed. That helps, believe it or not. As with the first game, Knack II’s creators seem to be aiming their game for kids and, by extension, families. There’s drop-in co-op and a storyline that brings back Lucas and his uncle from the first game, with the former now a little older and, soon enough, making eyes at the young woman accompanying them and Knack. There’s a war brewing between humanity and goblins, and there’s a secret history unearthed involving a hidden city and ancient, yet advanced technology. That hidden history serves the game design well, as it justifies arming enemies with much more interesting weaponry and armor than what they had in the first game. Oh, no. I think I’m even getting interested in Knack II’s back-story! At the halfway point, Knack II comes off as a plucky over-achiever. It is not revolutionary and we’re not quite talking Game of the Year contender, but it is the evolution that its mediocre predecessor needed. It’s a fun game that I’m more than happy to make time to finish, even in a season crowded with more hyped games. It’s got a central gimmick, the size-changing thing, that works really well. It’s a throwback to a wonderful style of PlayStation game it had seemed Sony was done with. 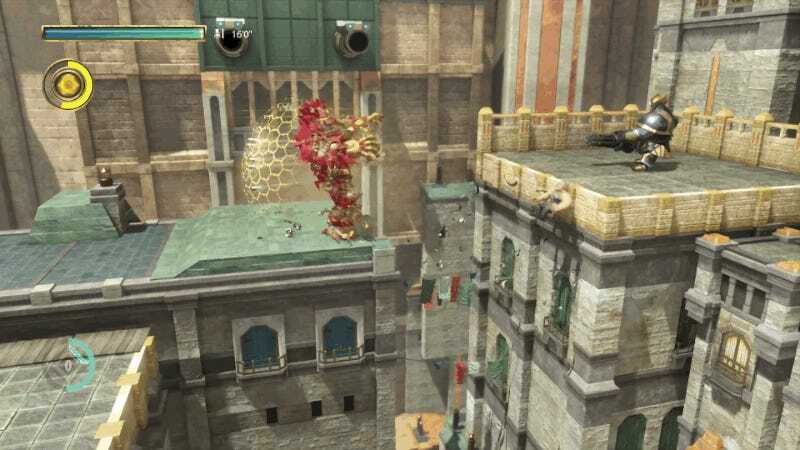 In my review of the first Knack, I wrote: “It’s not that I want to knock Knack. It’s a launch game. Launch games seldom offer more than what Knack offers. You get a game you can show off to friends. You get a game that hints at what new gaming hardware can do. You get a game that feels ready to be supplanted by a richer sequel.” Knack II appears to be that sequel. It’s less of a punchline and more of a success than I ever expected it to be.